9M16 revenue met 72% of our full year expectations of S$3,764mn. 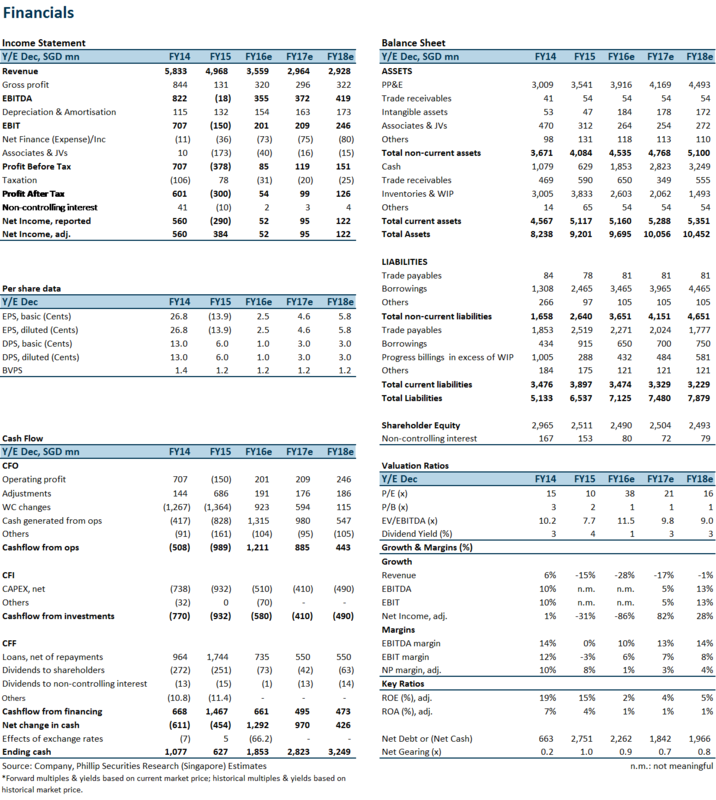 S$258mn gross profit met 69% of our full year expectations of S$376mn. S$44mn net profit only met 26% of our full year expectations of S$172mn. Downgrade to “Sell” as we cut our earnings forecast for FY17 by 55% with a lower TP at S$0.87 (S$1.14 previously). 9M16 revenue plummeted 25% y-o-y to S$2,714mn, mainly attributed to lower revenue recognition due to slower progressive payment and delivery deferment requests from clients. 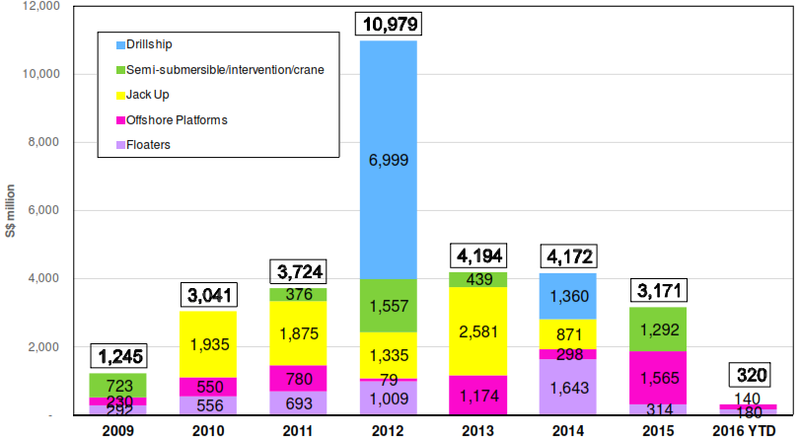 During 3Q16, the group managed to deliver 3 offshore platforms (Wheatstone, Siemens Dudgeon, and Yamal PAU module), which matched management’s expectation. However, deliveries in the drilling segments (jack-ups, semi-subs, and drillships) were frozen over the last quarter. 3Q16 was a quiet period for SMM to gain new business other than ship repairing, as there was zero growth of contracts q-o-q. As a result, the value of new contracts YTD remained unchanged from 1H16, at S$320m (see Figure 1). Comparatively, the Group won S$2.9bn worth of new contracts in 9M15. Meanwhile, the order backlog continued to fall amid smooth recognition of revenue. 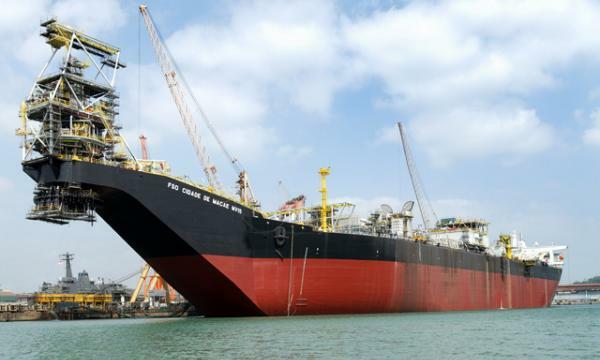 Referring to Figure 2, compared to backlog valued at S$10.4bn as of Dec-15, the amount was reported at S$8.4bn as of Sep-16, S$3.1bn out of which belonged to Sete Brasil drillships contracts. 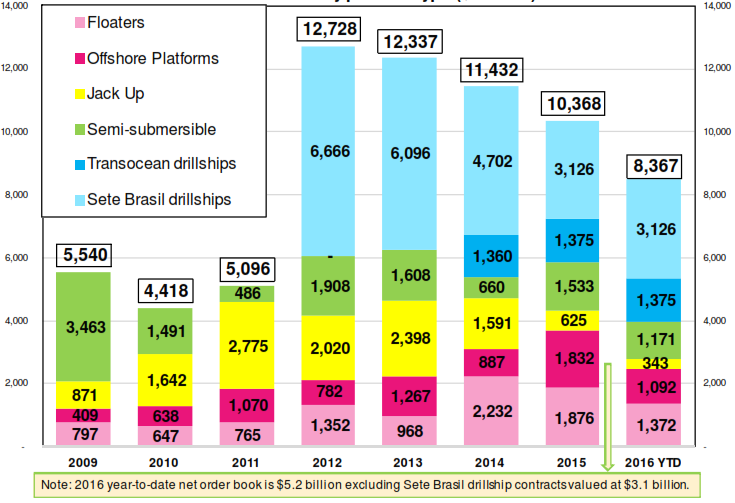 Sete Brasil has filed for judicial restructuring plan in Apr-16 and submitted it in Aug-16. Management has been active in following up with the arbitration proceedings, but we think that it could take a relatively long time to reach the final settlement. However the management believed the S$329mn of provision related to Sete Brasil’s projects made in FY15 was adequate. Moving forward, according to management’s guidance, SMM is facing more difficulties to achieve the scheduled deliveries in FY17 due to customer deferments, thus it is still struggling to monetise from the order book in the near term. 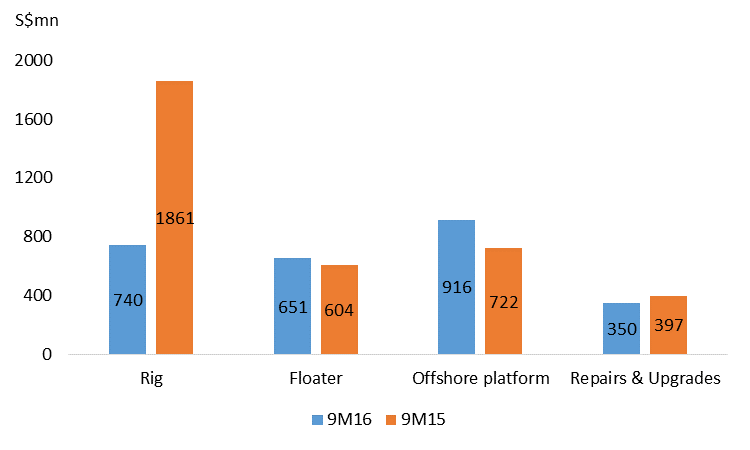 As shown in Figure 3, owing to the success of securing substantial size of orders from floater and offshore platform projects, both segments slightly outperformed YTD in terms of y-o-y growth. In 3Q16, the group tried to maintain the positive momentum in these segments by making several acquisitions. In Aug-16, besides acquiring the remaining 15% stake in PPL Shipyard, it fully acquired LMG Marin AS, which specializes in ship design and engineering, especially of floaters and LNG vessels. These moves allowed the group to gain flexibility and efficiency when undertaking design and construction work for new orders, and more importantly, it will reduce cost without needing to outsource other 3rd party houses. Since FY15, SMM has laid off workforce of roughly 8,000 from the peak of 36,000 before FY14. On the other hand, the group also terminated several sub-contractors and reallocated manpower from the decreasing drilling activities to non-drilling ones. Through implementing salary freeze and adjustments of remuneration components for management team, SMM has been actively trying to optimize operating costs. Relieving indebtedness, but still need more improvements. As of 9M16, SMM reported S$4.1bn of total borrowings and bore a total S$62.9mn of interest expenses. Excluding cash on hand, net debt amounted to S$2.6bn, down 5% YTD, resulting in lower gearing (net debt-to-equity) at 1.03x, a slight improvement from 1.1x as of 1H16. Solvency weakened substantially though with interest coverage (EBITDA/interest expenses) at 4.2x in 9M16, compared to 4.8x in 1H16. The higher interest burden further suppressed the declining net profits over the 9 months this year. We believe that the management has been actively trying to reduce the debt level. 9M16 results missed our previous target substantially, because the group reported S$22mn of net loss mainly due to S$28mn of loss from associates as well as S$20mn of FX loss in 3Q16. Comparatively, the losses from associates was S$24mn, and FX gain was S$35 in 3Q15. Furthermore, without new contracts to replenish the order books, together with deferments and defaults on existing orders, the performance going forward is expected to be under downward pressure. We revised our forecasts to account for weaker than expected performance YTD, higher finance expenses and expected losses in associates and joint ventures, which led to a lower net income of S$95mn and EPS of 4.6 SG cents in FY17e. Our FY17e and FY18e net income/EPS are adjusted downwards 55% and 43% respectively from previous forecast. Currently, SMM is trading at a 12-month forward PE of 19.0x. We downgrade our call to Sell with a lowered TP of S$0.87 (from S$1.14), based on a PER of 19.0x. This implies a downside of 31.8% from the last close price. Guangzhi graduated from Singapore Management University with a Master degree in Applied Finance and from South China University of Technology with a Bachelor degree in Electronic Commerce. The current sector coverages include Energy, Utilities, and Mining sectors. 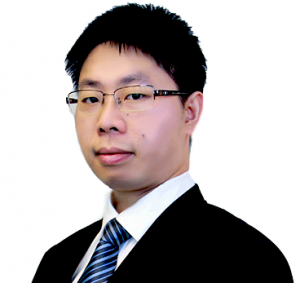 He has 3 years experience in equity research in both Hong Kong and Singapore market. He is the mandarin spokesperson for Phillip Securities Research in relation to China-related projects and all mandarin seminars and client events.